The lab will consists of 3 VMs (to start with), a controller, and two compute nodes. Wile OpenStack can be installed on a variety of Linux operating systems, this series will be focusing on Ubuntu version 14.04. The first thing we need to do is create a base image. Without a base image, we’re going to be forced to install Ubuntu individually on each server which is not ideal. So the first thing you’ll want to do is download the correct ISO and upload it to your ProxMox server. Note: Getting around in ProxMox is out of scope for this series. 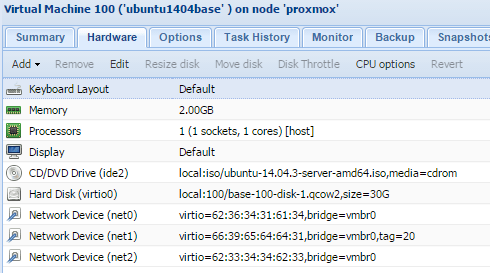 HOWEVER – ProxMox has a rather large following on the internet which means that Google is your friend here. Note: This will be the first time we need VM network connectivity. If that’s not working, we need to fix that first. In this case Im assuming you have DHCP enabled on VLAN 10, VLAN 10 has a means to get to the internet, and that the VMs are using that for initial connectivity. Modify the 3 settings above to have the new values as shown above. Note: Each of the below bolded items needs to be completed on each VM. In some cases I list the entire config needed for each VM, in other cases I list what needs to change and assume you’ll change it to the correct value. Now reboot the VMs and make sure you can ping each of the VMs IP addresses on VLAN 10 and VLAN 20. Also make sure you can do basic name resolution of each VM. That’s it! We are now ready to begin the OpenStack installation in our next post! Note: Now would be a good time to take snapshots of the VMs in case you want to revert to an earlier point. I’ll make a couple of other suggestions as to when I would recommend taking them but I found them hugely helpful in this lab work!